Ceram, a materials technology company in Stoke-on-Trent in the U.K., is coordinating a project funded by the European Commission to develop new biocompatible materials suitable for stents that help keep blood vessels open in the heart. The project, known as Rebiostent, is receiving €4.58 million of its €5.87 million ($US 6.19 million of $7.93 million) from the EU’s Seventh Framework Programme that supports research and innovation in Europe. Stents are small mesh tubes implanted in a patient’s weak or narrowed arteries. 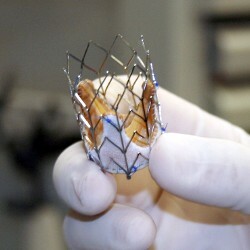 The mesh material in stents is often metallic, with some stents configured to slowly release a continuous flow of medicine. Metallic stents, however, can cause adverse reactions, including inflammation, blood clots, and restenosis or narrowing of arteries. The Rebiostent project aims to develop biocompatible materials for arterial stents that reduce or eliminate these adverse reactions. These materials, says Ceram, will have the ability to degrade naturally and be absorbed into the blood stream, as well as release medications. In addition, the stent material will encourage rapid endothelialization or growth of a thin layer of tissue over the mesh to protect circulating blood cells. Ceram is serving as the project coordinator. Some 13 other companies, universities, and research institutes in the U.K., Ireland, Germany, Italy, and Spain are taking part. The project begins this month and runs through December 2016. Ceram is a subsidiary of British Ceramic Research Ltd, and provides testing, analysis, and quality assurance services, as well as development of advanced materials in ceramics, metals, and polymers. Beginning on 1 February, the company is joining with partners in the U.S. and Europe to become Lucideon, but still continue to provide the same range of materials services. Finance, Joint ventures/collaborations biomedical, Europe, grant, heart disease, materials science, medical device, U.K.